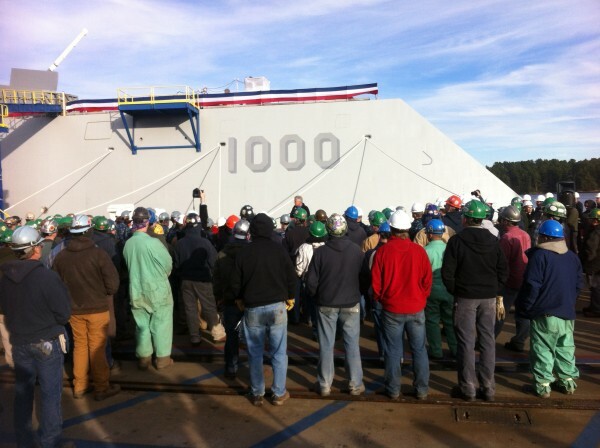 Following a tour of the future USS Zumwalt, Secretary of the Navy Chuck Hagel spoke to shipbuilders and the crew of the DDG-1000 at Bath Iron Works in November 2013. A defense industry analyst has said funding to begin building a DDG-51 is likely to be awarded to Bath Iron Works. BATH, Maine — A leading defense industry analyst said Tuesday that Bath Iron Works is likely to secure the first $100 million the shipyard needs to build a DDG 51 destroyer that lacked funding because of last year’s automatic federal budget cuts. In June, the Department of Defense awarded contracts for nine of Arleigh Burke-class guided missile destroyers, five to Ingalls Shipbuilding in Pascagoula, Miss., and four to BIW, with the option for a fifth. But automatic federal spending cuts known as sequestration, which took effect in March 2013 after Congress failed to strike a budget and national debt reduction deal, resulted in a more than $300 million shortfall in funding for the fifth DDG-51. The $100 million, while not enough to fund the entire ship, would allow Bath Iron Works to begin work on the hull, according to Loren Thompson of the Arlington, Va.-based Lexington Institute. Maine’s congressional delegation, which issued a new call for the $100 million on Monday, could then work to secure the remaining funding to allow the destroyer to be built, Thompson said. In December, President Barack Obama signed the National Defense Authorization Act, which included $100 million to fill the shortfall, but the Senate Appropriations Subcommittee on Defense — on which Sen. Susan Collins, R-Maine, is a senior member — must now appropriate that funding. Thompson said Tuesday by phone that, based on its past performance, Maine’s four-person congressional delegation will likely secure that money. U.S. Reps. Chellie Pingree and Mike Michaud, both Democrats, on Monday wrote to congressional leaders on the committee to argue in favor of the funding. “The DDG-51 is a workhorse of the fleet and restoring the funding for the 10th ship in the multiyear procurement program is essential to making sure that workers at the yards building these ships stay on the job and we maintain the industrial shipbuilding capacity that is critical to maintaining the Navy’s readiness,” they wrote. Securing the fifth destroyer would not immediately affect staffing levels at Bath Iron Works, shipyard spokesman Jim DeMartini said Tuesday. The recently signed National Defense Authorization Act also includes another amendment authored by Collins and King that settled a decades-old lawsuit and allows work on the third DDG-1000’s steel deckhouse, hangar and aft vertical launching missile system modules to continue at BIW. The A-12 aircraft lawsuit stems from 1991 when the Pentagon canceled a $4.8 billion stealth aircraft contract with General Dynamics and McDonnell Douglas, which has since been acquired by Boeing, according to Aviation Week. General Dynamics and Boeing sued the government for wrongful contract termination and the case has been in legal limbo ever since. Language in the 2014 Defense Authorization Act allows the Navy to receive $400 million worth of military hardware at no cost, including a nearly $200 million credit for the third DDG-1000, the next-generation destroyer being built at Bath Iron Works. According to Collins, this firms up the construction program and protects jobs at the Bath shipyard. On Saturday, Collins said the settlement was requested by the Navy and agreed to by all parties.